Thirty days away from their third calf, these girls gathered in the shade are watching me change the irrigation water on the pasture. 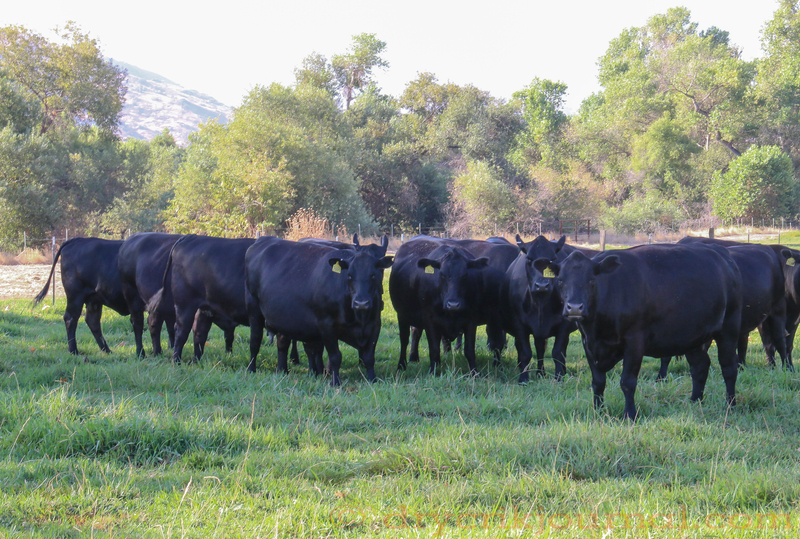 Bred to Vintage Angus bulls, we’re excited about their calves, though a bit dismayed that it’s that time of year again. On a normal year, they would be on dry feed in the hills, but with little water at the higher elevations, we’ve kept them closer to home. You are near the fires? Not the big ones, but we’ve had several small fires near enough to have to deal with smoke. Everything everywhere is tinder dry. I’ve noticed. I’m heading to Fresno in about an hour. The air in the Valley has been pretty bad. Animal husbandry is such an art, is it not . . .
Lots of metaphors and personification, like poetry. Nope– real, live, irrigated green. What beautiful animals they are. I guess I’m lucky. But check out http://wp.me/p5rgVm-Hi It is a little bit of magic. John, very nice stock. You should be proud! A nice bunch of heifers from 2012.